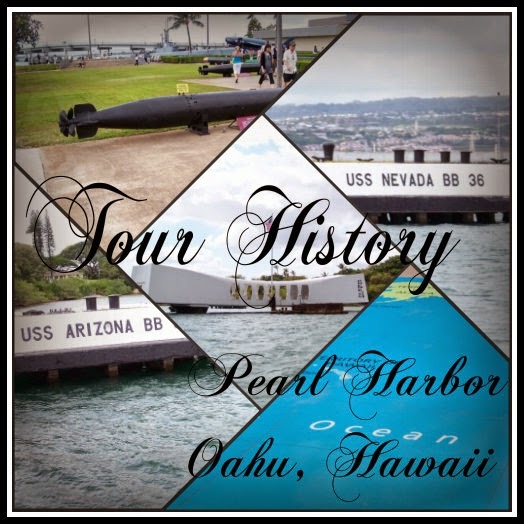 If you ever have the opportunity to visit Oahu, Hawaii you'll want to be sure to add this historical tour on your list of things to do. 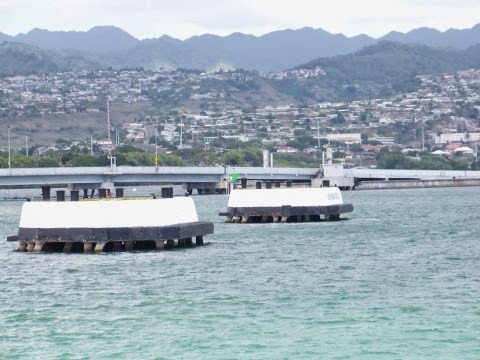 The attack on Pearl Harbor was December 7, 1941 and you can tour this historical World War II site just west of Honolulu at Lagoon Harbor. As you board the ferry that will take you out to the monument, you can also see the markers that indicate the other ship resting places. 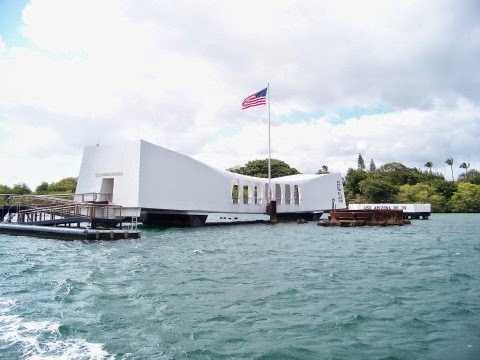 The USS Arizona Memorial, stands out among the blue waters and tropical green surroundings. They take you over in tour groups and yes you will have to purchase tickets for this. 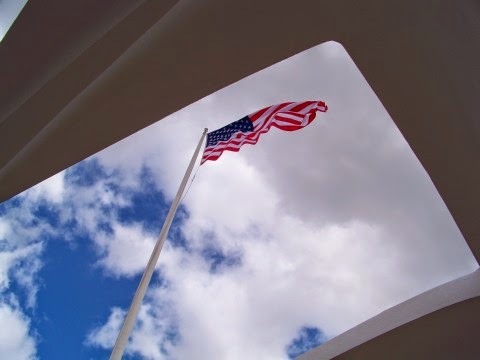 Once you are on the memorial you can spend as much time as you'd like, and just take the next ferry back when you are ready. 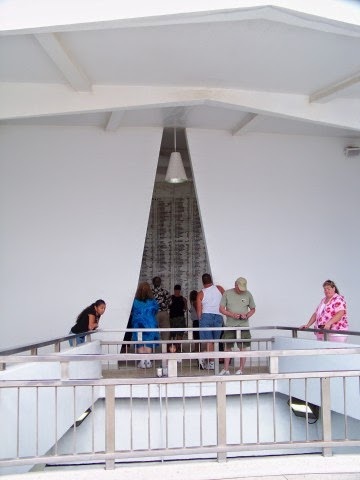 The view into the room that holds the names of everyone who passed away on that day in 1941. 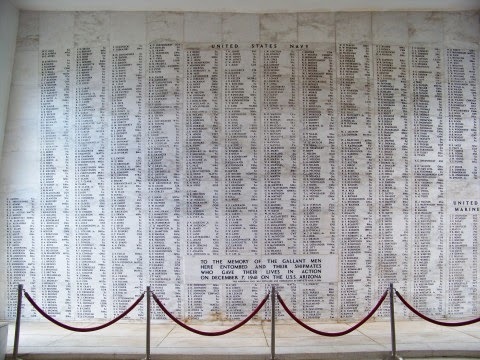 If you have relatives who were apart of this day in 1941, you can search for their names on the remembrance wall. Any age can take this tour. 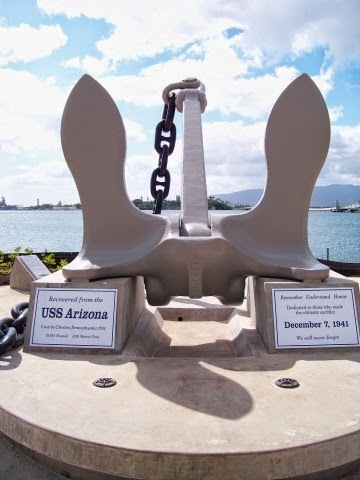 But please remember, this is a memorial. Even though you are a tourist, you should show respect not only for the deceased, but for others on the tour. Keep your children quiet, a respectful voice when touring any memorial should be low, similar to how you would speak to another in a library. 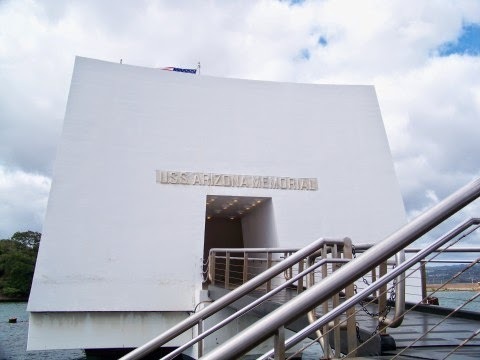 If your bringing your kids, make sure they are not running around, crying or yelling and ruining the memorial for everyone else who is visiting at that time. Just remember to show respect! 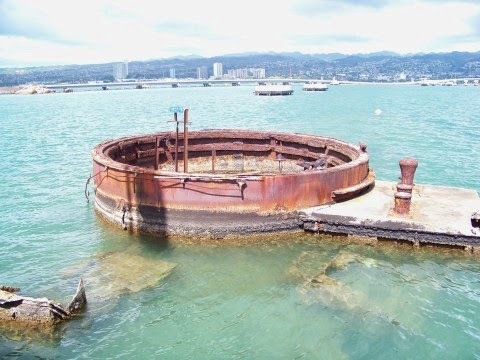 From the memorial you can look down into the water and see the actual ship itself, the rusted tops of it are quite visible. 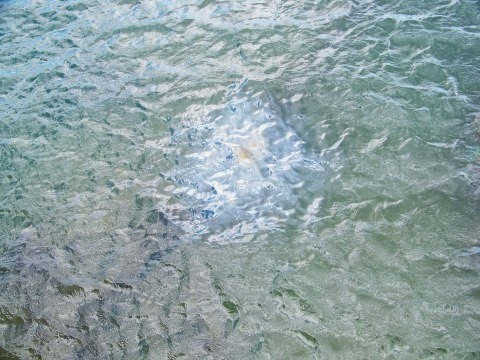 Some sections like above stick up out of the water, others are just below the surface. I bet you are wondering why I included this picture of water. It's not just water, in fact if you look in the center the discolored water is actually oil that was put into the ship in 1941. Yes, oil that is still leaking from the ship that sunk over 72 years ago. If you watch the water, you'll see it seep up in bubbles. If you are like me, you would never think a ship that sunk 72 years ago could possibly still be leaking oil. It's kind of amazing isn't it, to think that you are seeing something that is still and after the fact result of that fateful day long ago in our history. When will it stop leaking oil? They don't know for sure, it could be any day or years to come??? But it is pretty cool to see it, at least I thought so! 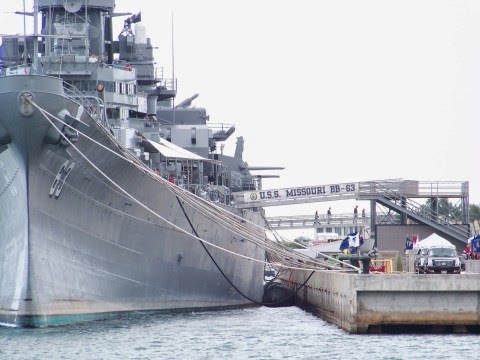 You can also see the USS Missouri from the memorial. 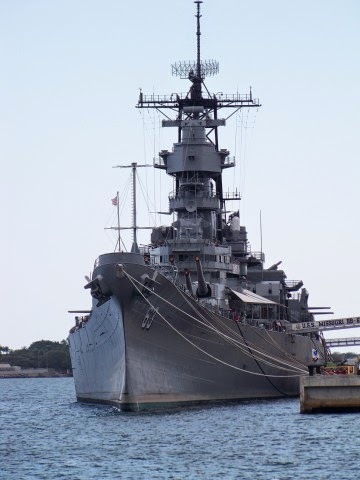 You can actually go inside and tour the Missouri if you'd like, but you get to it from a different harbor and the fee's are separate from that of Pearl Harbor. When you take the ferry back to the harbor, you can walk around and tour several other area's along the coast here. 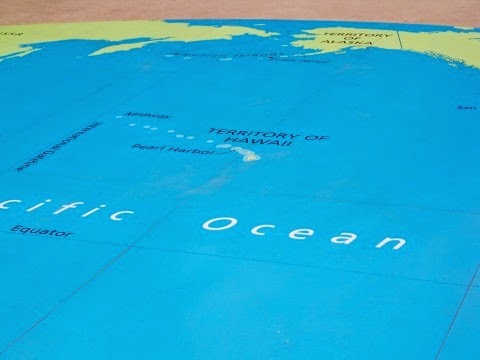 They have a large map, that gives (for those who don't understand how close Japan is) a realistic view of where the planes came from in Japan as they made their way to Oahu. Additionally, people don't understand how much of a role Alaska played in WWII, so you can take a view of that, and see also why Japan chose these two locations for what they did. 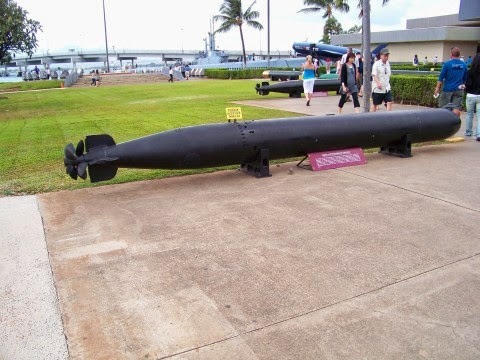 So you can see how big those missile's that are on the ships and subs are, you can view a few examples along the memorial walkway at the harbor. 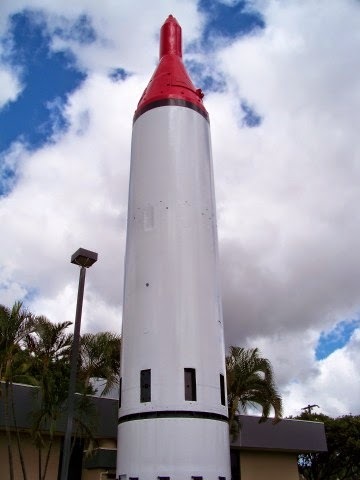 * There are gift shops and cafes in case you want to spend an afternoon or half a day in the area. However, you can easily see everything at a leisurely pace in a few hours.